Weighty Matters: Book Review: Hold that Hidden Salt! Maybe it’s because you’ve been diagnosed with high blood pressure, or are at increased risk of stroke or heart disease. Perhaps you simply want to lead a healthier lifestyle. Whatever the reason, the question I hear on a regular basis is: How do I lower my sodium intake? Throwing away the salt shaker is a great start, but given the incredible saltiness of most supermarket purchased packaged foods, it’s often not enough. Registered Dietitian and author of Hold That Hidden Salt! Maureen Tilley understands this and has created a cookbook that provides "recipes for delicious alternatives to processed, salt-heavy supermarket favourites". Canadians average 3400 mg of sodium per day with 75% coming from processed foods. The average adult needs only 1500 mg daily. So why is there so much sodium in our food supply? According to Maureen, it’s to generate profits for salt manufacturers and food companies who use it to cheaply preserve foods and improve their flavour. Food companies argue that without the amount of salt they’re using their products would be tasteless. They’ve even attempted to demonstrate this by providing product samples without salt to show how ‘poor’ they are without it. What they conveniently forget to mention is that if they were required to reduce the amount of sodium they would have to switch to more expensive substitutions which would negatively affect their bottom line, substitutes that they don’t add into the foods with the removed sodium. 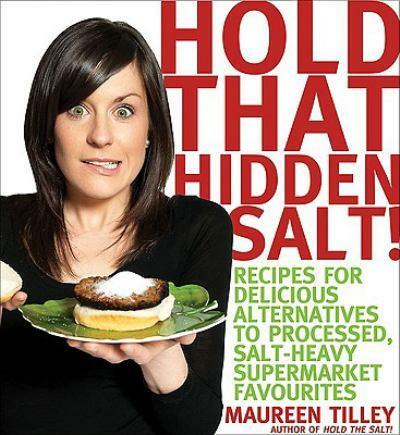 If you’re trying to reduce your home’s sodium intake, I highly recommend picking up Maureen’s book. It is well organized, easy to read and if nothing else will get you cooking more foods from scratch – something we should all do more frequently if we want to live healthier lives (and save money!). The book begins by explaining how to determine the amount of sodium in a food accompanied by a list of which foods are high in sodium. Some are more obvious than others – e.g. frozen meals are a main culprit whereas breads may not come to mind as quickly but are often quite laden with the stuff. Also discussed are daily sodium requirements by age, and easy to follow explanations of high blood pressure and the DASH (Dietary Approaches to Stop Hypertension) dietary guidelines. Knorr Frozen Shrimp, Asparagus and Penne (1300 mg per 340 g serving) vs. Maureen’s Garlic and Basil Shrimp Medley recipe (141 mg per serving). Quaker Blueberry Muffin Mix (300 mg per 38 g serving) vs. Maureen’s Blueberry Bran Muffin recipe (87 mg per 54 g serving). I prepared two recipes: curry, lentil and sweet potato burgers (p. 117) and cinnamon garlic sweet potato and turnip fries (p. 74). Both recipes were easy to follow and took less than 45 min (prep and cooking time). The burgers were tasty, filling and high in fibre (7 grams per burger) while the curry paired well with the sweet potato. The fries were certainly different as using cinnamon and garlic together is not something I’ve tried before. I was pleasantly surprised by the combination, though I found the cinnamon over-powered the garlic as I was eating them. I only really noticed the garlic about thirty minutes later. I prepared them for my younger brother (who is a very picky eater) and my mother on two separate occasions. Both enjoyed them and stated that they would have them again. As for the sodium: We saved 378 mg per burger (compared to M&M Angus Beef Burgers) and 283 mg per serving for the fries (compared with McCain Superfries Xtracrispy Straight Cut Fries). In the end, I can confidently recommend this book to not only those looking to reduce their sodium intake but to anyone who wishes to live healthier by consuming less processed food and more home-cooked meals.